Return of dessert for breakfast! Seriously though, these little pancakes taste like a full-on dessert. Not that I’m sick of eating cookies for breakfast because I don’t think that will ever get old, but it was time to try something new. And since the creation of these I have been going crazy experimenting with different types of dessert-like pancakes that are also healthy and flourless. So stay tuned 🙂 Especially come pumpkin season because yes, I have already been baking with pumpkin for you guys (A LOT of pumpkin baking) and it is taking a lot of will power to keep from publishing some pumpkin pancakes this very day. Sneak preview: they are divine. However as pumpkin obsessed as I am, I think these are my favorite for right now. I’m totally a sucker for anything oatmeal cookie tasting. I won’t lie to you and say these pancakes are light and fluffy because they aren’t – they aren’t filled with sugar and cream and butter and oil. But they aren’t dense by any means either. Especially if you are careful to not over-beat or mix the batter. I’ll admit to you I’m sometimes a lazy cook (okay you probably already knew that based off the amount of one pot or crockpot dinners on my site) and sometimes I don’t separate wet from dry ingredients when I’m making a recipe. However, I have tested this recipe several times and it honestly makes a difference in this one – the wet ingredients really need to be well mixed before you combine them with the dry ingredients. I know we all hate wasting dishes, but the end result of these pancakes is SO worth it. Since these pancakes are filled to the brim with healthy ingredients, you’ll have to be a little bit careful cooking them. I found most success with using very little batter. About 3-4 tablespoons per pancake makes these easy to flip. If these pancakes get too large, they are quite hard (nearly impossible for huge pancakes) to flip. Also, and I’m sure this is obvious, but the better your griddle or skillet is (as far as being nonstick) the better these will work out. I’ve experimented with perfecting this recipe so many times and will say it’s best to not make any substitutions. Even “tried and true” changes may completely change how these pancakes turn out. The ingredient list and amounts below have yielded perfect results several times now and so I’ll say, for best results please follow the recipe exactly! 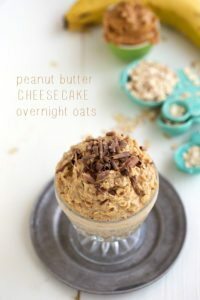 I recommend using vanilla flavored Greek yogurt and vanilla flavored almond milk for an extra burst of flavor (there really is a difference and it's awesome! ), but plain will work too. Make sure your banana measures at least 1/2 cup (I usually get about 1/2 cup + 1 tablespoon per banana for these pancakes) if you don't have this much, you may need to use a little bit of another banana. The riper your banana, the better these are. Measure the coconut oil when in liquid state. Make sure your oats are certified gluten-free if gluten-intolerant. Recipe inspired and made healthier/flourless by Rachael Ray's original pancake recipe. Dessert for breakfast is my favorite! These pancakes look amazing, Chelsea! I love that you used oats instead of flour in here. 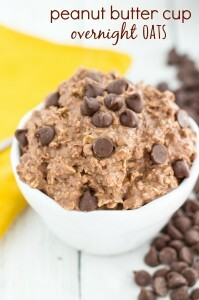 Sounds so delicious, especially with the chocolate chips! Pinned! Wow. Thank goodness I haven’t eaten breakfast yet this looks beyond epic! Because it’s healthy too, I’m gonna down the whole stack! Cheers Chelsea! Ohhh I love the sound of these AND of more dessert pancakes in the future–what are pancakes without chocolate anyways? 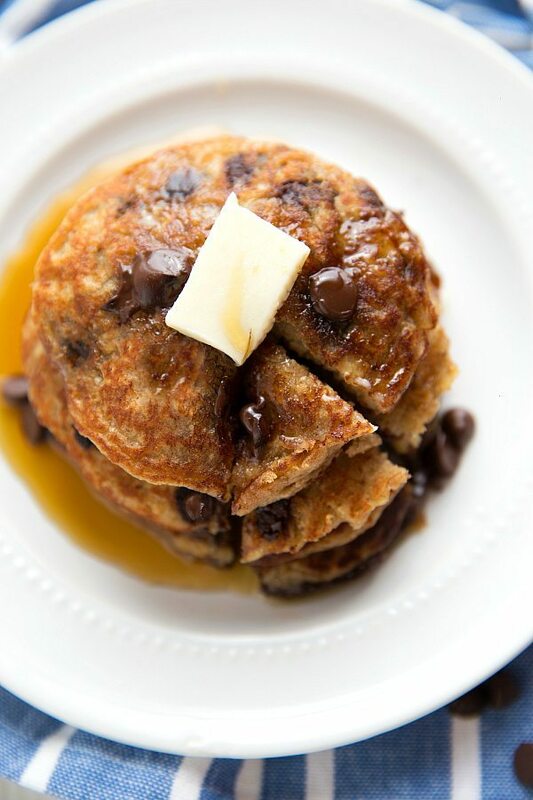 These pancakes look divine, and I love the healthy ingredients and the great flavor! 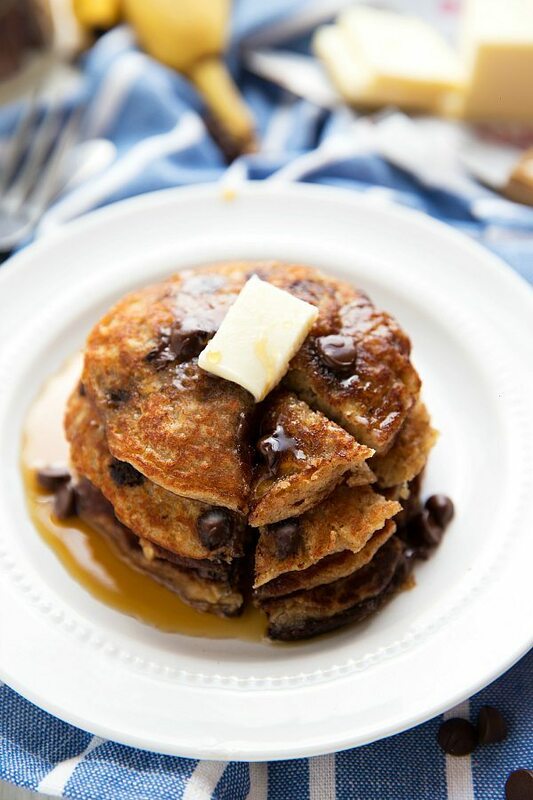 I’ve been on a pancake kick for breakfast recently and these look soooo good! I might have to add them the rotation 🙂 and bring on the pumpkin pancakes, I’m sure everyone is ready for pumpkin season to be back! It has been far far too long since I’ve made pancakes! 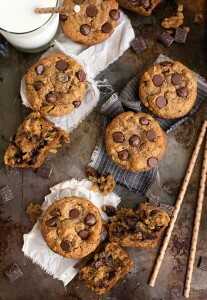 These sound so darn good – oatmeal cookie??? Yes yes! These look really yummy, Chelsea! I need some healthier recipes, and this actually calls for ingredients I can find in my small town grocery. Thank you. Thank you. I’m so happy to have found someone else who loves pumpkin so much to cook with it all year long! Bring on pumpkin in July! I love it! 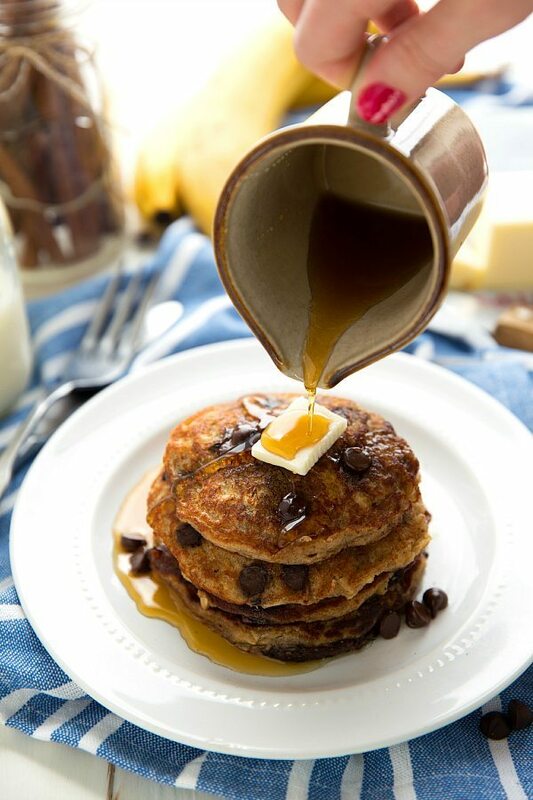 Oh – these pancakes look pretty terrific too! 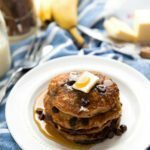 I’ve been looking for a delicious flourless pancake recipe and it seems like I found my perfect match! Will surely make it for the weekend’s breakfast! 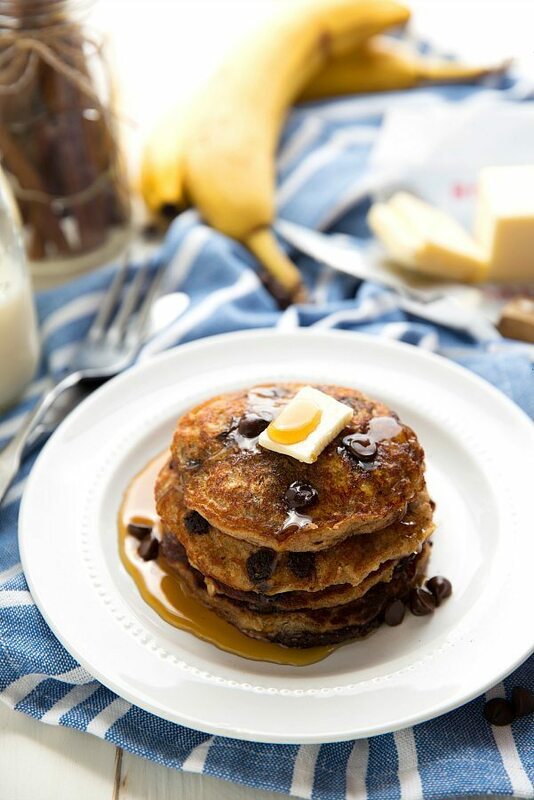 Oatmeal cookie pancakes that are healthy!-Amazing! Can’t wait to try these this weekend! These pancakes look so scrumptious! I’ve been toying with the idea of gluten free and may have to start with breakfast! You wouldn’t believe this but i made it. And it turned out to be the most delicious pancake ever. I had a really good time with it. Thank you very much my dear! What a sweet comment! Thanks so much Waylon 🙂 So glad to hear you enjoyed these so much!! These pancakes look amazing! Could I substitute the brown sugar for Stevia in order to get a much healthier recipe? Sorry Lou I have extremely limited experience with Stevia so I really couldn’t say. I don’t think stevia and brown sugar measure equally so you would have to figure out how much stevia to the amount of brown sugar. Sorry to not be of more help! I was so excited to try these but it was an epic fail 🙁 I’m not sure what went wrong but they were just a soggy mess and I couldn’t flip them at all. The one half I was able to salvage tasted really good but sadly did not resemble a pancake at all. Bummed. Hmm I’ve made these many, many times and never had a problem so I’d love to trouble shoot with you! Did you change out any of the ingredients? Did you change the method (instructions) at all? And are your baking agents fresh? I made these this week and they tasted great. I agree that they were difficult to flip. They never made it to ‘pancake’ consistency. Otherwise they were very good! This was a first for me grinding oats for oat flour! Yes they definitely require more patience to flip, but totally worth it for the health factors and good flavor I think 🙂 Thanks for the comment! And yay for your first time making oat flour – isn’t it so easy?! Loved the taste of these pancakes, but was wondering if you have a solution for a problem I had. Everything went fine until after I flipped the cakes. At first they seemed fine, but then they just collapsed–very thin! I was wondering if it was because I used pre-ground oat flour. Or perhaps there is not enough baking powder or baking soda. My hubby loved the taste of these. Thanks so much! Do you know if your baking agents (powder and soda) are fresh? 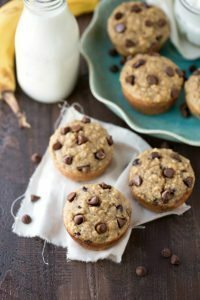 I made these this morning and they were AMAZING! I used blue berries instead of chocolate chips for a healthier alternative.